the EBLT Sandwich! 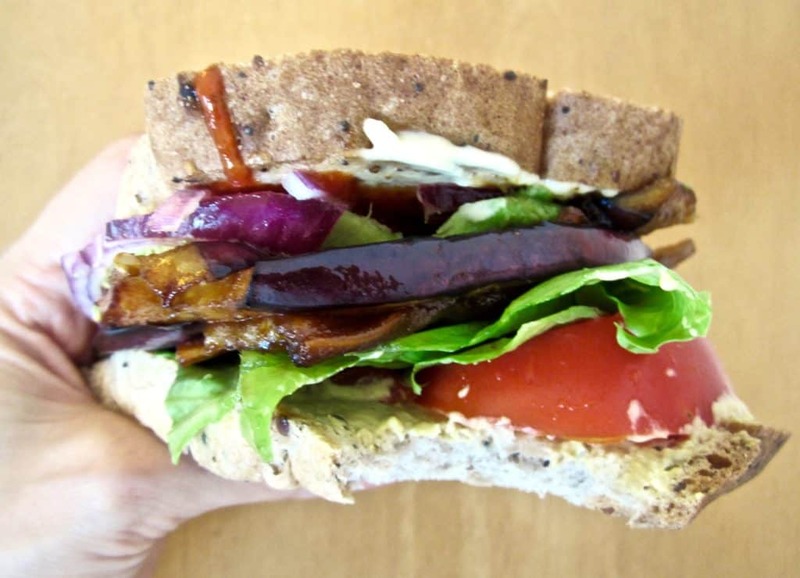 Eggplant Bacon, Lettuce and Tomato, a veganized version of the classic BLT sandwich. You guys, this sandwich TOTALLY rocks! Every time my husband and I eat it we just smile at each other in complete bliss as we devour our plates. It’s SO satisfying with its rich umami flavors, complemented by spicy Sriracha and dijon mustard and contrasted by the crisp lettuce and red onion. Of course, using the eggplant on a sandwich is just one idea. You can cut it into smaller pieces and add to a stir fry, put on top of a salad, layer into a lasagna… so many yummy applications! 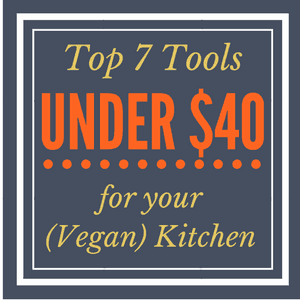 Food for Life – Vegan, Gluten free, Sprouted, Organic; comes in a variety of flavors! 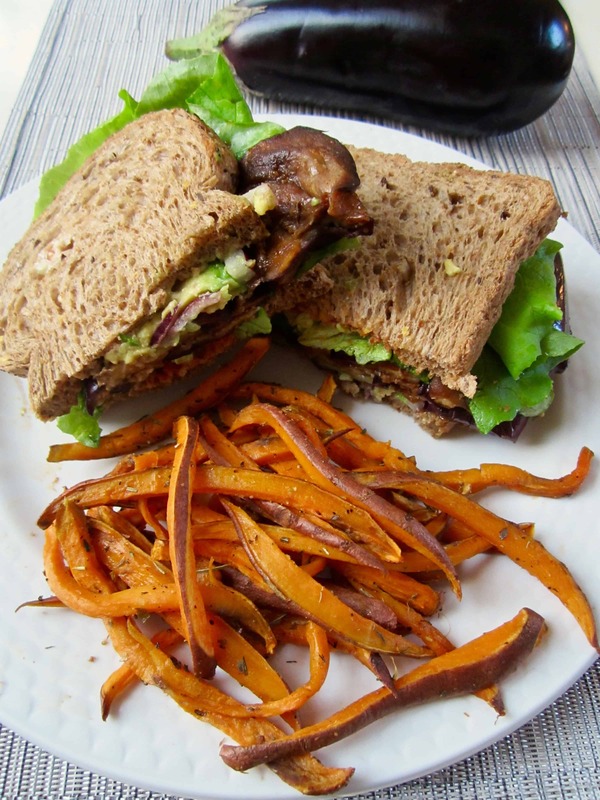 Hearty, Savory and HEALTHY vegan & gluten free BLT made with eggplant bacon! Destined to become a favorite. Cut the top and bottom off the eggplant. 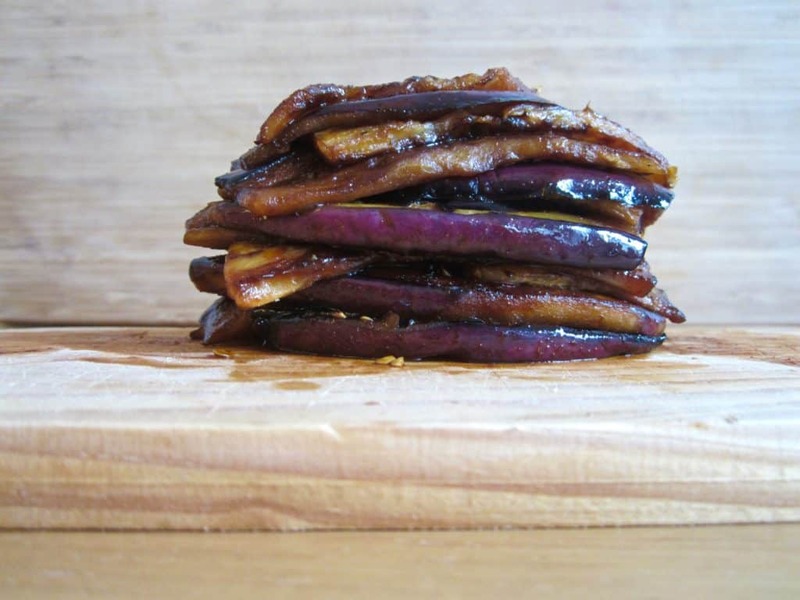 Slice eggplant lengthwise into strips of your desired thickness (I like mine about 1/4 inch). Stir together all remaining ingredients (except olive oil spray) and pour over the eggplant slices. Stir gently to mix and coat. Marinate for at least 20 minutes, stirring every 10 minutes or so to keep eggplant well coated. Turn a large skillet over medium heat. When hot, spray with olive oil spray and add eggplant slices in a single layer, working in two batches. Reserve leftover marinade. Cook eggplant until it’s browned on the bottom, about 3-5 minutes. Pour a few spoonfuls of marinade into the skillet and cook another minute, until marinade cooks off. Flip the slices and cook until they're browned on other side, about 3-5 minutes. Add a few more spoonfuls of marinade and cook another minute, until the marinade cooks off again. Remove from heat and assemble your sandwich with desired toppings!